Ordinary cells can be transformed into cancer cells through epigenetics — changes to DNA that turn genes on or off. Those gene changes can protect cells or make them vulnerable to disease processes including cancer. 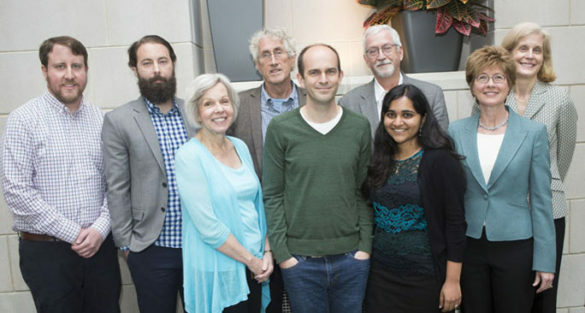 “Cancer Epigenetics — From Mechanisms to Therapies” was the topic of the Vanderbilt-Ingram Cancer Center (VICC) Annual Scientific Retreat held May 4 at the Vanderbilt Student Life Center. The event featured guest speakers from other academic medical centers and research laboratories who shared details of their recent cancer research efforts, as well as a poster presentation session featuring research from more than 100 VICC investigators. Christopher Vakoc, M.D., Ph.D., associate professor at Cold Spring Harbor Laboratory in New York, studies chromatin — the part of the cell nucleus consisting of DNA and proteins. Vakoc discussed how the BRD4 complex regulates chromatin changes that support the development of leukemia, plus efforts to determine mechanisms of sensitivity and resistance to BRD4 inhibition in leukemia. Chromatin remodeling also is the focus of research by Gerald Crabtree, M.D., professor of Pathology and Developmental Biology at Stanford University in California, who presented the methods he and his colleagues have used to determine that at least 15 subunits make up the BAF complex and mutations in these subunits are associated with development of specific cancers and some neurological diseases. They are designing and synthesizing small molecule inhibitors that rapidly and reversibly activate or inhibit chromatin regulatory mechanisms. Suzanne Baker, Ph.D., who specializes in pediatric brain tumors at St. Jude Children’s Research Hospital in Memphis, discussed new research that identified histone H3 mutations as a molecular hallmark of high grade tumors called gliomas. The identification of this and other related mutations may provide targets for new therapies. Timothy Ley, M.D., professor of Medicine and Genetics at Washington University School of Medicine, St. Louis, examined the complexity of acute myeloid leukemia (AML), a disease for which there have been no new treatment regimes in 30 years. Ley shared details about recently identified recurrent gene mutations in the DNMT3A and IDH1/2 genes found in more than 20 percent of all AML cases and his efforts to determine if those mutations can be targeted for treatment efforts. Ann Richmond, Ph.D., Ingram Professor of Cancer Research, associate director for Research Education and vice chair of the Department of Cancer Biology, organized the retreat. “This year’s speakers provided important insights that are valuable for those of us who study epigenetic cellular processes that regulate gene expression, and for our clinicians who treat cancer patients here at the VICC,” said Richmond. Three outstanding students also were recognized for their cancer research efforts. A tie vote by program leaders led to the naming of two VICC Graduate Students of the Year: Kami Bhat, from the laboratory of David Cortez, Ph.D., and Tim Shaver from the lab of Jennifer Pietenpol, Executive Vice President for Research at VUMC, director of VICC and Benjamin F. Byrd Jr. Professor of Oncology. Elwood Mullins, Ph.D., who works in the laboratory of Brandt Eichman, Ph.D., was recognized as VICC Postdoctoral Fellow of the Year.